You can find me as @WhatIsRobShaw on Twitter, at https://rob-shaw.net/, or walking on the North York Moors! My name is Rob and I'm an urban and social geographer with an interest in all things night. I have been working at Newcastle since September 2015, having previously been at Durham University where I obtained my PhD in 2012. 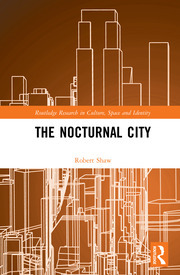 My first book, which builds on much of my research to date The Nocturnal City, was published in 2018. It outlines how a deeper exploration of 'night' might help us understand the city and contemporary debates in urban studies. I have carried out research exploring the night-time economy in the UK, changing artificial lighting technologies and the Nuit Debout protest movement in France. In addition, I have published on ecosophical theories in geography, focusing on the work of Felix Guattari in particular, and have a wider conceptual interest in concepts of earth, self and temporality. My work has been funded by the ESRC, and published in several journals including Environment and Planning A, Geoforum and Theory, Culture and Society. As well as my research interests into the night and artificial lighting, I've published on social theory and environmental philosophy, notably on the work of Gregory Bateson and its intersections with the writings of Felix Guattari. Outside of geography my work has been picked up by anthropologists, cultural studies and sociologists. I've done a lot of undergraduate teaching, in particular on qualitative research methods. I can often be found walking on the moors and coastline of the North East of England and Yorkshire, or if I'm lucky in my home county of Cumbria. I'm also a big comedy fan, and this has led to a few performances at open mic nights, the results of which I'm told are not too terrible!